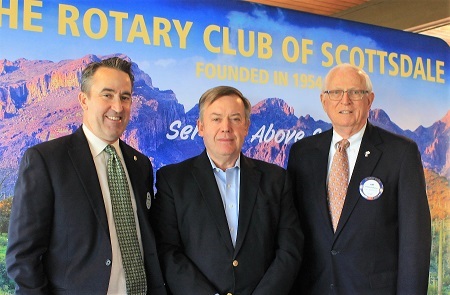 Dr. Michael M. Crow an educator, knowledge enterprise architect, science and technology policy scholar and higher education leader was keynote speaker at a recent Rotary Club of Scottsdale luncheon meeting. When introducing Dr. Crow to the Rotarians and guests, Rotarian Jim Bruner noted that Dr. Crow became the sixteenth president of Arizona State University in July 2002 and has spearheaded ASU’s rapid and groundbreaking transformative evolution into one of the world’s best public metropolitan research universities. During his talk, Dr. Crow shared insights of the “New American University,” model in which ASU simultaneously demonstrates comprehensive excellence, inclusivity representative of the ethnic and socioeconomic diversity of the United States, and consequential societal impact. Per Dr. Crow, ASU's charter states that ASU is a comprehensive public research university, measured not by who it excludes, but by whom it includes and how they succeed; advancing research and discovery of public value; and assuming fundamental responsibility for outcomes of economic, social, cultural and overall health of the communities it serves. Highlights of his comments included: Per US News & World Report (2016, 2017, 2018, 2019) ASU is number No. 1 university for innovation (ahead of Stanford and MIT); ASU is the top public university of choice for international students (140 countries); ASU is in the top 1 percent of the world's most prestigious universities as ranked by Times Higher Education; Since 2007, ASU has produced more Fulbright students than any other U.S. university, public or private; With over 115,000 currently enrolled students (on-campus and online), ASU is one of the nations largest universities; and, ASU has seen significant growth in the number of its engineering students (especially minorities and women) along with respective increase in retention rates, innovation and research engagement. Dr. Crow talked about the ASU's impact on the revitalized urban campus in downtown Phoenix's central city and the redevelopment of downtown Tempe mixed-use district. Per Dr. Crow, ASU is partnering with a premier university in Ghana to equip the next generation of business and engineering leaders to solve problems and help guide the West African nation’s future, funded by a $22 million grant from the MasterCard Foundation. 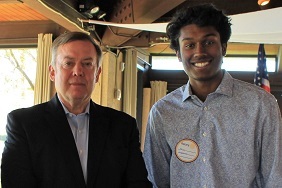 Coincidently at the same luncheon, Adway Gopakumar, a member of the Scottsdale Preparatory Academy's Rotary Interact Club (sponsored by the Rotary Club of Scottsdale), spoke of his high school's international non-profit - Liberation through Education. Adway stated that a future international project will provide school supplies, furniture, and basic necessities for an under-privileged elementary school located in Ghana. Dr. Crow offered to assist the Scottsdale Prep high school students by making the necessary connections to support this project with engineering solutions and/or equipment being addressed by ASU's Ghana partnership. For more information about the Rotary Club of Scottsdale speakers, projects, programs and meeting dates and locations - see www.scottsdalerotary.org. Visitors to Club meetings are always welcome - call 480-945-6158.